Why is Neuroscience important? The most complex structure in the universe is the three pound mass of cells within your skull called the brain. The brain consists of about 100 billion neurons, which is about the same number as all the stars in our Milky Way galaxy and the number of galaxies in the known universe. It also contains about a trillion glial cells, which contribute to the proper function of neurons. Like any complex machine, the brain contains a lot of parts, each of which has subparts, which themselves have subparts, all the way down to the “nuts and bolts” — the neurons and glia. In this Cheat Sheet, you find information on the key parts of the brain and the role and function of the cells that make up the nervous system. The nervous system consists of the central nervous system (the brain and spinal cord), the peripheral nervous system (the sensory and motor neurons), and the autonomic nervous system (which regulates body processes such as digestion and heart rate). Sensory neurons: These neurons tell the rest of the brain about the external and internal environment. Communication neurons: Communication neurons transmit signals from one brain area to another. Computation neurons: The vast majority of neurons in vertebrates are computation neurons. Computation neurons extract and process information coming in from the senses, compare that information to what’s in memory, and use the information to plan and execute behavior. Each of the several hundred brain regions contains approximately several dozen distinct types of computational neurons that mediate the function of that brain area. Myelin: Many axons are ensheathed by glial cell processes that provide extra insulation. This insulation is comprised of oligodendrocytes that form myelin, giving rise to myelinated axons. The gaps between the myelin wrappings are called nodes of Ranvier. This is where the action potential (electrical nerve impulse) repeats, thus enabling the signal to maintain its strength over long distances. Myelinated axons have fast conduction velocities in which the action potentials travel at several hundred meters per second. Many smaller axons in the nervous system are unmyelinated and conduct action potentials more slowly. Astrocytes: Astrocytes are star-shaped cells that provide metabolic support to neurons, as well as form the blood brain barrier. Astrocytes contribute significantly to synaptic function by maintaining the proper concentration of chemicals at the synapse and are also known to release gliotransmitters that can regulate synaptic transmission. The ability of astrocytes to integrate synaptic activity and their close physical location to synapses has given rise to the term tripartite synapse. The tripartite synapse refers to three entities: the neuronal pre-synaptic terminal, the neuronal post-synaptic terminal, and the adjacent process of an astrocyte. Microglia: These cells are the only resident immune cells in the brain. They act as a first line of immune defense in the brain. Microglia are scavengers, removing dead cells and infectious agents by a process called phagocytosis. Although microglia can be activated in disease states to release harmful chemicals that injure neurons, microglia have been shown to provide trophic support to neurons. More recent studies have shown that microglia prune unnecessary synapses during development, which is required for proper central nervous system maturation. There are obvious structural differences between neurons and most other cells. 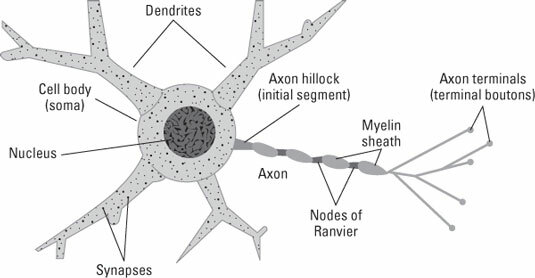 While most non-neuronal cells resemble squashed spheroids, neurons typically have a “dendritic tree” of branches (or processes) arising from the cell body (or soma), plus a single process called an axon that also emanates from the cell body but runs for large distances (sometimes even up to several feet) before it branches. While the dendrites receive synaptic inputs from other cells, the axon sends the output of the cell to other cells. The main structural parts of a neuron. What really distinguishes the nervous system from any other functioning group is the complexity of the neuronal interconnections called synapses. The human brain has on the order of 100 billion neurons, each with a unique set of as many as 10,000 synaptic inputs, yielding a total of about a quadrillion synapses — a number even larger than the U.S. national debt in pennies! The number of possible distinct states of this system is virtually uncountable. The neocortex plays an important role in neuroscience. When you look at a human brain from the top or sides, almost everything you see is neocortex. It’s called “neo” because it is a relatively recent invention of mammals. Prior to mammals, animals like reptiles and birds had relatively small brains with very specialized areas for processing sensory information and controlling behavior. The neocortex enables the most complex mental activity that people associate with being human. The human neocortex is so large that it completely covers all the rest of the brain except for a bit of cerebellum that sticks out from the back. The frontal lobe includes all the neocortex from the front, most anterior part of the brain to a major sulcus, called the central sulcus, that runs from side to side at about the middle of the brain. The parietal lobe goes straight back from the central sulcus to the border with the occipital lobe. The occipital lobe is the lobe at the most posterior tip. 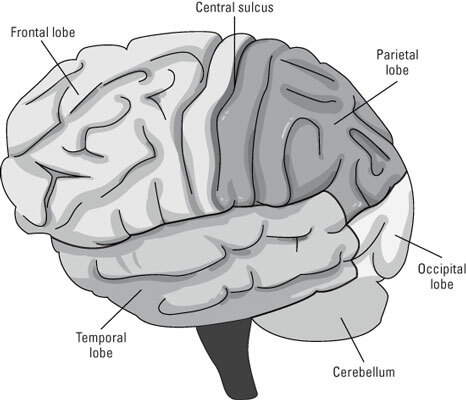 There is no clear continuous border between parietal and occipital lobes in most brains. The temporal lobe is the tongue-like extension from the border between the occipital and parietal lobes that extends in the anterior direction. A large neocortex distinguishes mammals from all other animals. Species that existed before mammals could clearly move, sense their environment, and exhibit many complex behaviors such as those that are now seen in birds and lizards. These abilities were all enabled by brain structures older than, and hierarchically below, the neocortex. What the neocortex allowed was a new level of advanced behavior — particularly social behavior — culminating in humans with tool making and, ultimately, language and high-level consciousness. The brain is composed of two nearly mirror-image lobes called the left and right hemispheres. The left hemisphere receives most inputs from and controls mostly the right side of the body. This hemisphere in humans is also specialized for language, rule-based reasoning, and analytic skills. The right hemisphere deals with the left side of the body, and it is better at visual pattern recognition and more holistic kinds of perception. In most tasks, the two hemispheres use a divide-and-conquer strategy, where the left hemisphere processes the details, and the right takes in the big picture. The two hemispheres are connected by the largest fiber tract in the brain, the corpus callosum, which contains 200 million fibers. Knowing the four lobes of the brain is important for neuroscience. The neocortex is divided into four major lobes: the frontal lobe, the parietal lobe, the temporal lobe, and occipital lobe. These lobes are further divided into different regions. The frontal lobes are involved with control of movement, from stimulation of individual muscles to abstract planning about what to do. The parietal lobe processes visual, auditory and touch information. The temporal lobe is the primary area for early auditory processing and a high-level visual processing area. It also processes some aspects of smell (olfaction). The occipital lobe processes visual information and sends it to the parietal and temporal lobes. Taste and some olfaction are processed in the posterior frontal lobe. The four lobes and the regions within each. The prefrontal cortex: In humans, the prefrontal cortex takes up the majority of the frontal lobe. The prefrontal cortex is crucial for the performance of almost all skills requiring intelligence. The prefrontal cortex tends to be larger in primates than other mammals, and it’s larger in humans than in other primates. This is correlated with the amount of high level planning done by members of different species. Most mammals operate mostly on instinct and don’t live in complexly differentiated social groups. Primates, on the other hand, have complex male and female hierarchies and may hatch plots against each other that span years of planning. Humans build tools, modify their environments for their own purposes, and have specific relationships with up to hundreds of other individuals (and this was even before Facebook). 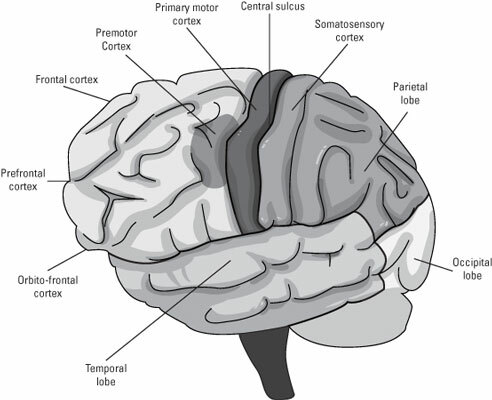 The orbitofrontal cortex: This area is the anterior and medial part of the prefrontal cortex. The orbitofrontal cortex is essential for risk and reward assessment and for what might be called moral judgment. Patients with damage to this area may have normal or superior intelligence as assessed by IQ tests but lack even a rudimentary concept of manners or appropriate actions in social contexts; they also lose almost all risk aversion despite clear knowledge of bad consequences. Primary motor cortex: The primary motor cortex is the strip of brain area just anterior to the central sulcus, the most posterior portion of the frontal lobe. The brain can take direct control of the muscles from the spinal cord. It does this through projections from the primary motor cortex. Neurons in the primary motor cortex travel down the spinal cord and synapse on the same motor neurons that mediate reflexes. In theory, this direct control allows far more flexibility and adaptability. Premotor cortex: The job of the premotor cortex is to consciously monitor movement sequences, using sensory feedback. After the basal ganglia and prefrontal cortex select the goal, the premotor cortex coordinates the steps to reach that goal. Activity in the premotor cortex helps you learn what to pay attention to while you perform a complicated motor sequence and what to do when you get stuck at some particular point. Think of the frontal cortex as “polarized” from anterior (front) to posterior (back). Farthest back, at the central sulcus, are neural wires going almost directly to muscles. In front of that are areas that organize and sequence movements. In front of that are abstract planning levels. At these abstract levels, for example, you select from a variety of different strategies that may involve completely different muscles, muscles sequences, or, as in the tennis shot, the decision to not move at all. The parietal lobe contains neurons that receive sensory information from the skin and tongue, and processes sensory information from the ears and eyes that are received in other lobes. The major sensory inputs from the skin (touch, temperature, and pain receptors) relay through the thalamus to parietal lobe. The occipital lobe processes visual input that is sent to the brain from the retinas. The retinas project through the thalamus onto the posterior pole of the occipital lobe, called V1 (for visual area one), so that activity in different areas of V1 is related to whatever is in the image around your current point of gaze. The fact that the visual system gets an entire lobe for processing emphasizes the importance of high visual acuity and processing among our senses. The brain’s temporal lobe combines auditory and visual information. The superior (upper) and medial (central) aspect of the temporal lobe receives auditory input from the part of the thalamus that relays information from the ears. The inferior (lower) part of the temporal lobe does visual processing for object and pattern recognition. The medial and anterior parts of the temporal lobe are involved in very high-order visual recognition (being able to recognize faces, for example), as well as recognition depending on memory. Neuroscience tells us that the neocortex interacts with the rest of the brain primarily through a structure called the thalamus. The thalamus, which is underneath (and hierarchically below) the neocortex, functions like a command center that controls what information goes between different parts of the neocortex and the rest of the brain. While the neocortex can do very fine-grained analysis of the patterns you’re looking at, the thalamus controls where you look. When your neocortex is damaged, you lose particular skills. If your thalamus is damaged sufficiently, you lose consciousness. The hypothalamus controls homeostatic body functions such as temperature and circadian rhythms. The thalamus and the limbic system. Think of the thalamus as the gateway to the cortex. Virtually all signals from the senses are relayed through the thalamus, as are the signals from other subcortical areas. Many areas of the neocortex also communicate with each other through the thalamus. The hippocampus: The hippocampus has a crucial function in the creation of memory. The hippocampus receives inputs from virtually the entire neocortex. Through specialized adjustable synaptic receptors called NMDA receptors, it can associate together virtually any constellation of properties that define an object and its context. The amygdala: The amygdala is primarily involved with emotional processing and memory. The amygdala interacts with the prefrontal cortex to generate and process the major emotions of anger, happiness, disgust, surprise, sadness, and, particularly, fear. People who have sustained damage to their amygdalas have reduced abilities to react to and avoid situations that induce fear. 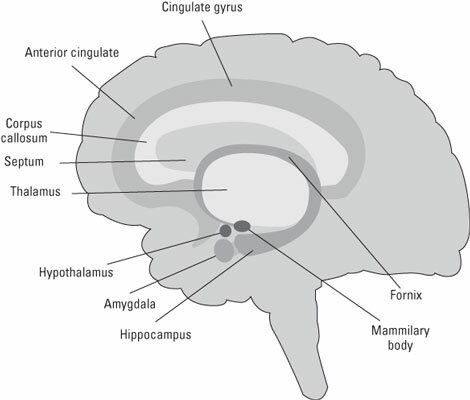 Orbitofrontal cortex: The orbitofrontal cortex is where the amygdala and other structures of the limbic system interact with the part of the prefrontal cortex. Suppose that, on some particular Friday evening while driving home, you’re almost hit by another car at a particular intersection. It is very likely that, for a long time after that, when approaching that intersection, particularly on Fridays, you’ll get a little twinge of fear or uneasiness. Your orbitofrontal cortex has stored the circumstances, and the amygdala has stored the fear. The anterior cingulate cortex: The anterior cingulate cortex seems to monitor the progress toward whatever goal you’re pursuing and generates an “uh-oh” signal when things aren’t working out to indicate a change in strategy may be in order. The basal ganglia: The basal ganglia consist of five major nuclei: the caudate, putamen, globus palladus, substantia nigra, and subthalamic nucleus. These nuclei comprise a highly interconnected system that interacts with the thalamus and neocortex to control behavior.